Do a little test with some liquid kelp (aka seaweed) on a pumpkin leaf and you will see some of the power of kelp. Put a drop of the kelp on a leaf and then pull that leaf from the plant and watch what happens were the spot of kelp was applied. Over a number of days you'll see the majority of the leaf shrivel and dry out, but the spot were the kelp was applied will stay green longer. I personally have never done research as to why this happens, but I would guess it is a combination of nutrients and cytonkins in the kelp. I know kelp can help pull nutrients into the plant, so my guess is that the hormones in the kelp along with the many nutrients it supplies gives it the ability to keeps the cells alive longer. If you have a more scientific explanation, please let me know. I like to use kelp on my plants. I think tired old leaves that have been beaten up in the wind and hot sun during the summer can get a number of benefits from kelp this time of year (for that matter, all year around). 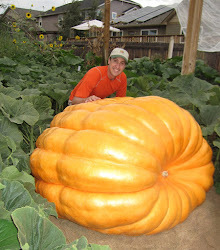 Healthy leaves late in the season add a lot of pounds to a pumpkin. My biggest pumpkin had the healthiest looking leaves I've ever had later into the season. The vast majority of the leaves were green and shiny right until we got a very big rain storm for a week in September and only after that did the plant start to show some age. This evening I gave the 1985 Miller plant a foliar application of 2 tablespoons of liquid kelp, 1 tablespoon of liquid fish, with some fulvic acid and yucca. I also sprayed some of it under the leaf canopy onto the ground. Humic acid and/or fulvic acid enhances the benefits of kelp, so when doing foliar applications always apply a little of one or the other or both with the kelp. I used to buy the bottle so liquid seaweed, but I found it cheaper to buy the dried, concentrate kelp and mix it with water. The price is about the same for the two, but with the dried kelp you get gallons of product rather than just a small bottle.